Cardiac rehabilitation is an outpatient service of Sidney Health Center for individuals who are recovering from a heart attack or related heart condition. It is a comprehensive exercise, education, and behavioral modification program designed to improve the physical and emotional condition of patients with heart disease. Components of the program vary by individual need and are constructed to meet those needs. Staff assists clients with lifestyle changes following heart related events such as heart attacks, angioplasties, stint placement and bypass surgeries. A registered nurse supervises patients during exercise and assists them with progression through the rehabilitation process. In addition, staff teaches patients about their disease, counsels them on individual risk factors, and provides reinforcement for lifestyle changes. 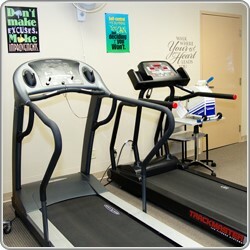 Outpatient cardiac rehabilitation is a physician-referred program. The cardiac patient must be referred by his or her physician to participate in our outpatient cardiac rehabilitation program. All cardiac patients are encouraged to talk with their physicians about the benefits of cardiac rehabilitation. Our program is Medicare approved and covered by most insurance companies.